LA n Sync supports individual applicants and collaborative applicant teams as they pursue major governmental and philanthropic funding opportunities. We do this by researching upcoming grants, developing partnerships, providing technical assistance, and helping outside funders build relationships within the region. LA n Sync proactively researches and identifies significant federal and state funding opportunities based on LA n Sync criteria. We share this research with the community at no cost through its Grants Forecaster and other targeted communications. As part of our forecasting process, LA n Sync scans more than 45 federal agencies as well as the most recent federal budget for grant opportunities and new federal money. We also receive information about grant opportunities through its network of partners. All of this information is aggregated on the Grants Forecaster and disseminated to the community at large. LA n Sync serves as an information hub for grant opportunities, making it a unique one-stop community resource. LA n Sync leverages our extensive network to convene key members of Los Angeles’ governmental, academic, nonprofit, business, and philanthropic communities to promote dialogue, share research, explore opportunities, develop cross-sector partnerships, spur innovation, and attract funding. LA n Sync believes that sharing ideas and building relationships produces more than good grant applications. The relationship building that comes from these conversations lays the groundwork for future successes and active collaborations. By supporting collaborations and partnership building at the community level, we are able to bring a broader range of voices to the table. This leads to more natural and spontaneous collaborations within the community, and serves to reduce isolation within issue areas. It also improves knowledge sharing and governance on regional matters. LA n Sync works with its grantees on an individual basis to determine if their applications might benefit from strategic cross-sector partnerships, and then helps develop and strengthen these partnerships to produce strong and competitive collaborative applicant teams. LA n Sync actively develops relationships with governmental and philanthropic leaders to raise awareness and stimulate interest in investing in the region. We help these leaders navigate Los Angeles’s complex network of public and private resources, as well as the county’s 88 municipalities, by hosting conversations that build partnerships and foster an understanding about shared goals. To stimulate investment in the region, LA n Sync regularly hosts dialogues with national leaders across all levels of government and models innovative programs that can be replicated beyond the Los Angeles region. In 2015 LA n Sync hosted the National Resource Network, a coalition of experienced consultants who work in partnership with the White House Council on Strong Cities, Strong Communities. Prior to that, we hosted Secretary of Education Arne Duncan and 40 key cross-sector leaders for a roundtable discussion on the educational needs of the region. This meeting was a collaborative effort with First 5 LA, the LA Partnership for Early Childhood Investment, the Los Angeles Area Chamber of Commerce, the Advancement Project, and the White House Domestic Policy Council. LA n Sync has also supported delegations from Los Angeles to travel to Washington, DC, to build dialogue with elected officials and educate them on the pressing needs of the region. On an ongoing basis, we keep these officials informed when submissions from Los Angeles are being considered for funding, so they can raise awareness and advocate on their behalf. LA n Sync provides valuable technical assistance in the form of grant management, grant writing support, partnership development, letters of support, and matching funds on an as-needed basis to nonprofit organizations and municipalities pursuing funding opportunities to meet the critical needs of the Los Angeles County region. Once an applicant has been selected to receive LA n Sync’s support, we assign a grant manager to be the liaison for the lead applicant during the grant application process. The grant manager works closely with the grant applicant to determine the type and scope of assistance needed to increase the viability and competitiveness of the funding application. LA n Sync recognizes that the success of a funding application can rest on the applicant’s effectiveness in creating a powerful narrative. Without this, an applicant can be disadvantaged, no matter how good their programs and services. To address this need, and the need for other kinds of support in the grant writing process, we have curated a vetted list of highly skilled grant development professionals who specialize in designing, formulating, preparing, and submitting major funding applications. LA n Sync works with its grantees to pair them with the most effective consultant(s) for their project. LA n Sync validates the applications it works on by providing a letter of support. This letter is numbered for authenticity, and bears the LA n Sync seal. It represents not only the endorsement of LA n Sync, but also that of its full list of cross-sector key partners as co-signatories. We also work with applicants to seek specialized endorsements from additional sources. For instance, when LA n Sync supported the Smart Manufacturing Leadership Coalition in applying for a Clean Energy Smart Manufacturing grant, we secured letters from key business organizations throughout the state. The Strategic Response Fund is a repository of pooled matching funds, which are available to Sync grantees to enhance the competitiveness of their funding applications. LA n Sync continually seeks ways to bring new federal and state funding to Los Angeles County and advocate for the region. 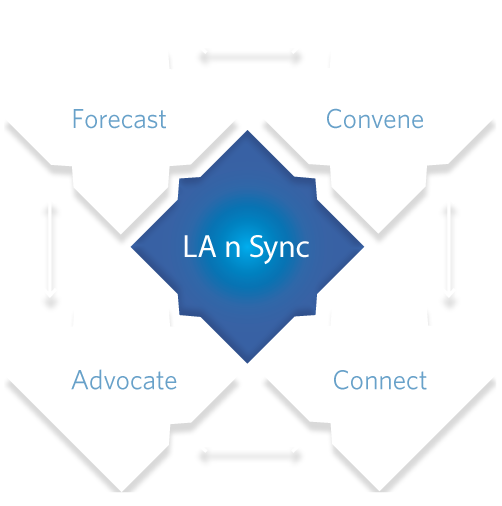 Though every funding opportunity is unique, LA n Sync’s process includes ongoing forecasting of grant opportunities, connecting and convening potential collaborators, and supporting applicants as they prepare their submissions to increase the applicants’ competitive advantage. LA n Sync is continually scanning for major federal, state, and private philanthropic funding opportunities that could benefit the L.A. region. When a major funding opportunity is announced, LA n Sync reaches out to colleagues and collaborators to help conduct a regional scan of potential applicants. These collaborators can be nonprofit organizations, governmental agencies, funding collaboratives, or individual consultants with expertise in the sector of the funding opportunity. In collaboration with its partners, Sync alerts eligible entities in L.A. County about potential grant opportunities and invites potential grant applicants to submit a request for support (RFS) outlining proposed projects. LA n Sync conducts a preliminary review of the requests for support (RFS). If additional vetting is required, LA n Sync may submit the RFS to appropriate cross-sector partners for additional review. Based on preliminary reviews, LA n Sync selects the most competitive applicants to receive grant management support. Applicants submit a scope of work, which Sync uses to pair them with a grant development consultant and Sync grants manager. Grant development consultant and LA n Sync grants manager work with applicants to review their projects and assess their competitiveness using the scoring rubric contained in the Notice of Funding. LA n Sync works with applicants to enhance the competitiveness of proposed projects and complete their applications. LA n Sync endorses the applications with a letter of support from Sync on behalf of its key partners. LA n Sync reaches out to local legislators and other partners to raise awareness about the pending applications, and to ask them to lend their support. If an application is successful, LA n Sync works with the applicant to ensure a successful start to the project. If the application is denied, LA n Sync reviews the scoring and feedback with the applicant to help the applicant determine next steps.